The “Emerald Triangle” refers to an area that is located in Northern California. It grows and legally distributes cannabis in the state of California and has been doing so since the ‘60s. Experts believe that over 1 billion dollars in revenue is accumulated annually because of the growth of this plant. The Emerald Triangle is the heart and soul of the area in which it resides. Businesses as well as individuals directly or indirectly benefit from this growing business. This article will be your guide to the Emerald Triangle. It will help you learn more about it and should prove to be a nice reference should you have any questions about the topic. 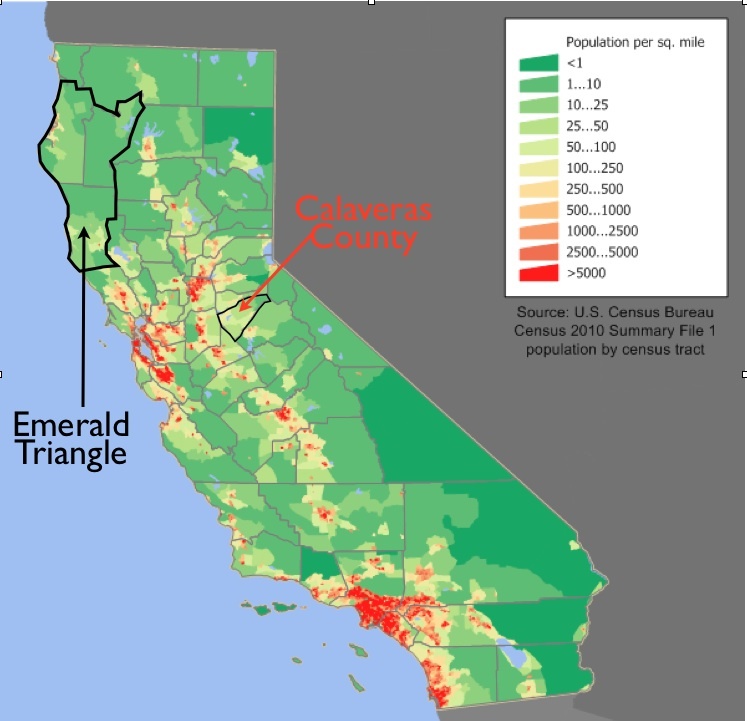 The Emerald Triangle is located in Northern California, relatively close to the Pacific Coast. The geography of this area really allows the growth of cannabis to thrive. Any other area would most likely prove to be unsustainable for the production of such a delicate plant. Prepare to enter curvy, narrow, and isolated roads if you would like to visit the Emerald Triangle. Currently, medical marijuana is legal in 16 states but that number is expected to grow. Few can argue that medical doses of this plant will be legal in every state across the country. And the truth is that the Emerald Triangle is a perfect example at how profitable this business can be. Tucked away in the heart of California, they offer some of the highest-quality cannabis in the world. The best part is that they really help surrounding areas thrive because of the massive amount of cash flow that they generate into the area. The Emerald Triangle has been thriving in Northern California since the mid ‘60s. It has been the ideal location for people who have wanted to make a living in the cannabis growing industry. And since California has already legalized the use of medical marijuana, it serves as an “on-base” customer for the Emerald Triangle. The cannabis trade in this region is extremely lucrative and it is believed that over two-thirds of California’s economy is propelled because of the Emerald Triangle. You can only imagine how healthy the country would be if this became legalized across the entire U.S.
How Much Revenue Does the Emerald Triangle Generate? The Emerald Triangle generates, on average, about 1 billion dollars each year. It is no wonder why the government has begun to make dramatic movements in the area of medical marijuana- and the legalization of cannabis altogether. Legalizing this plant would not only bring in a huge tax increase, but it would save most states billions of dollars each year since they would no longer need to enforce the prohibition of marihuana. If the Emerald Triangle were to bring a halt to their business in Northern California, the economy would go through a difficult time trying to recoup their losses. Not only do many patients rely on the positive medical effects of cannabis, but the state wouldn’t be able rely on the huge amount of tax revenue that it currently brings in. As you can see, the revenue that the Emerald Triangle brings in on an annual basis is very significant. The Emerald Triangle walks on a fine line that separates the use of medical marijuana and the regular smoking of cannabis. Although major crackdowns have been accomplished by the DEA and federal government, the triangle remains undeterred and continues to operate strong. The Emerald Triangle has been around since the mid ‘60s and has brought in a lot of revenue for the state of California. Currently, the marijuana industry produces more than 40 billion dollars each and every year. Legalizing this harmless plant would dramatically increase tax sales and save over 13 billion dollars by not enforcing the prohibition of it. Many people believe that the Emerald Triangle is not going anywhere, anytime soon and many states are expected to follow their paths in the future. I would like for someone to write me that is interested in suing the Mendo County Supervisors. I am not a grower but I live on 3rd Gate in Willits so I have been around growers for 17 years. I don’t consider that a problem. What I do consider a problem is a bad grower who diverts streams, terraces irresponsibly, cuts downs hundreds of trees etc. I have an environmental report that documents all of this. The county has this report and they are doing nothing. Fair enough, but everyone needs someone.. I guess you need to find a farmer like me that is internet connected and willing to risk communicating with you. We are slowly willing to surface and talk about our art and herbal medicine that we pride ourselves in cultivating and sharing. Saw this comment randomly online. We are looking to invest $$ or partner with an operator. We can buy the land and invest in operations. My question was how much does it cost of living to live in the emerald triangle? I can help you to grow! Next post: What Is A Medical Marijuana Collective?